The CNT-85 (top) and CNT-81. VICOM has announced the 8GHz Prescalar input option for the CNT-81/81R timer/counter/calibrators and 85/85R frequency counters from Pendulum Instrument. * High resolution - 50ps single-shot or 11 digits in 1s. * Microwave link carrier test. * Broadband communication test (ISM band). * RF instrument and component test. * Frequency-hopping signal capture e.g. Bluetooth, wireless LANs etc. The ultra-fast/ultra-resolution CNT-81 timer/counter/calibrators can calibrate time, phase and frequency with ultimate accuracy, speed and resolution. The CNT-81 features almost every possible time/phase/frequency measuring function, down to 1ps time resolution (50ps single-shot), built-in mathematical and statistical processing, very advanced arming and hold-off functions, modulation domain analysis and much more. Both the CNT-81 and 81R come equipped with GPIB-interface as standard. Optional timebase oscillators extend stability of the CNT-81 to 0.02 ppm/year whereas the CNT-81R has a built-in Rubidium standard. 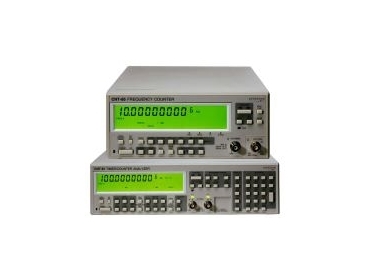 The CNT-85 frequency counter is a compact high-performance (300MHz) counter, ideal for portable frequency calibration. Very easy to use, the Auto Set function ensures perfect triggering on any type of input signal. The CNT-85 offers many features such as an input signal level meter (analogue bar graph), pulse width and duty cycle measurements. The CNT-85R is an excellent portable calibrator for the master clocks in GSM base stations. Its built-in Rubidium time base never needs to be adjusted during the lifetime of the network. Both counters can be equipped with optional HF-inputs to 2.7GHz and now 8GHz as well as a GPIB-interface for use in automatic test systems, or in PC-controlled instrument clusters.